Bryant and Jenni met in Hollywood and have been full-time, creative entrepreneurs for over 17 years. They joined hands and hearts on Bryant’s birthday, and haven’t been separated since. Born the same year — Jenni in Georgia and Bryant in Alabama — they were both spiritually curious, and interested in writing and photography since they were children. They had been wishing for each-other their whole lives, and met in Hollywood, when Bryant was an author and photographer and Jenni was a film producer and photographer. Working and playing together every day, we built a world-wide mission and ministry of love to remind people of the things they already deeply know, but sometimes — simply need a reminder to remember. Hand in hand, and side-by-side, we create, share, and live a life of service, creativity — and magic. We always believed that if you are in harmony with your soulmate and on your true mission of purpose, that life will reveal and deliver you to your highest destiny. It’s like a real-life Hollywood story of a powerful calling and devotion to each other, and something greater, that inspires our life work. When we finally met in person in Hollywood at the Cafe Solar — life would never be the same again. We struggled and sacrificed for our art. We didn't have much, but we had each other — and we had a shared dream; the dream of letting the power of art, images, and words flow through us to help others see the beauty we saw through the lens of our love and cameras. 17 years after founding McGill International, we founded Simple Reminders in 2010, as a way to share our daily inspiration, creativity, photography, writings, and passion for life with the world, and to inspire others — without charge. We received our first magical monthly check for our co-creation after many years of self-development, inner-work, service work, and always, always — paying it forward. Now funded, we began to expand our vision and dream, and not only our dreams — but the dreams of others. With the money flowing we did what any writer shutterbugs would do — we bought GEAR! We started investing in tools, ideas, creativity, experiences — and people. Travel, writing, photography, and cappuccinos — need we say more? As photographers and writers, every destination has a sentence or two for the next book, and so many great photos too. We set out into the world to see and learn a few things. Together, we have had many experiences — Tokyo, France, Italy, England, Thailand, Brazil, Hawaii, Germany, Austria, Mexico, The Bahamas, Canada, and here-and-there all over the great American States. Culture speaks deeply to us, and we love to share what we hear and learn. Our new opportunities afforded us the dream life — a chance to work on our mission from anywhere in the world. We found ourselves in some really amazing places to grow our mission of the heart. Laguna Beach enriched our lives with stunning views of the ocean all the way to Catalina. Just steps away from the beach, we spent countless hours and treasured family time on our private beach at Shaws Cove. Oh.. the sunsets, the dolphins, and the sounds of the roaring ocean. We still miss our mountain hikes right out our back door. Laguna was our playground for touching a deeper space of our creative endeavor, and sharing it with the world. Ojai was a center of peace and inner-work. With stunning landscapes, we enjoyed the live art of our spectacular canyon vista, and ate from the myriad fruit trees in our back yard. From the farmer’s markets, to the essence of Krishnamurti’s legacy upon the valley, and the reverent hilltop intentions that silently rang over the lands from meditation mount — we grew in strength and peaceful centeredness in Ojai. With regular trips to the Santa Barbara coast, our life was full of every imaginable beauty. If you love our work, it’s because you discovered a hint of what we found in the desert. From Joshua Tree starscapes, to our palm laden home in La Quinta — when we were not making our videos or shooting photos, we pretty much lived in our saltwater pool. There is not enough “film” or memory cards, to shoot the desert in all its grand diversity! The desert nights feel like a second skin, and the rustle of the palms under those crazy stars served as our loyal muse. Our desert life was the backdrop of so many family memories, and our venture into new forms of media, writing, and creating. Austin has been a fun stop on our roundabout, like a Portlandia with a strong sip of Don’t Mess with Texas. We love boots, music, and technology, so Austin tops the charts for those. Advertisers afforded us a remarkable city skyline view, beautiful riverside sunsets, city nightlife, and endless live music. In Austin, we dove into international community building, and connecting with fans and friends around the world in ways we had never before imagined. The gift of Austin is the heart of treasured royal relationships around the globe, that we will take with us for the rest of our lives. Austin came with technical and business challenges that made us wiser and served as a springboard to greater opportunities, that we are now embracing. For us, entrepreneurship is a place where imagination and creativity become meaningful forms of value in our lives, and in the lives of others. We are privileged and blessed to be able to travel, lecture, teach workshops, and participate at high levels in social leadership initiatives that we believe serve a higher purpose, and the dignity of others. Our international visibility has been a stage for outreach and support, not for mere money making, but for truly building people and filling them with courage and new ideas and possibilities. We believe in people, and have seen miracles arise from the power of words, faith, kindness, and community. No matter how public it gets, we are really simple people who enjoy family, music, writing, and using our gifts to serve others. We are foolish enough to believe our love can make the world a better place, and that’s the goal... has been from day one. Health discovery has been an important part of our mission together. Life without your health can be unbearable! We are very sensitive and empathetic to this issue. We know intimately the deep struggles and perseverance it takes to reclaim your health, because we have been there. Wonder-twin powers Activate! We have learned that your well-being is the platform from which you serve others. Your personal health is your greatest possession; the most significant foundation of any future you will have. We love sharing what we have learned about inner well-being and outer well-being with others. Remember. Life is a practice. You are what you do each day! We are on a mission of the heart — to bring empowering and positive messages to those in need! Jenni and I love what we do! 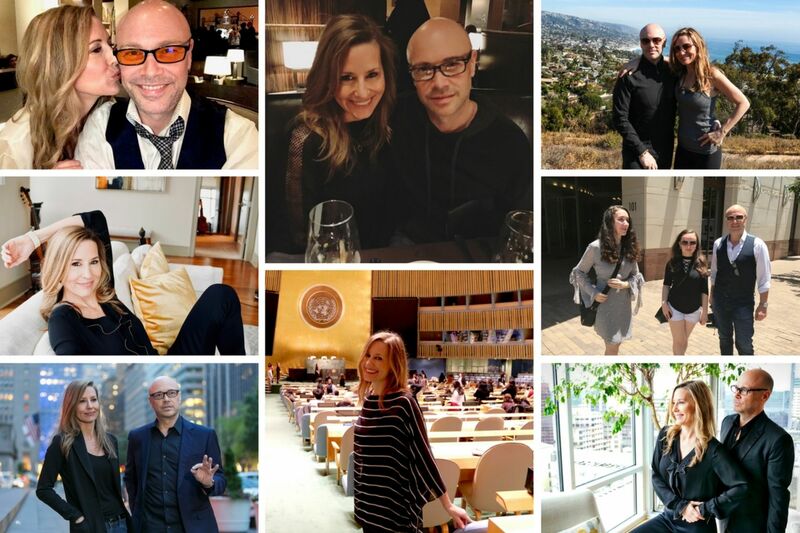 We love to travel the world and meet with interesting people, artists, business leaders, and creative achievers. We are living our dream life daily with passion. We are in love with life and truly enjoy sharing the beauty we encounter daily with all of you. Our work calls us to many destinations, and our life continues to bring us rich blessings for growth, new adventures and friendships, and a deeper sharing of the things that have rooted us in service from the moment we began our mission of love together. Who knows where you will find us next. But we know one thing for sure, that inspiration will be guiding our steps, like it always has, and we appreciate each and every one of you around the world — our family of good-spirited kindred souls, who still believe good things are possible in the world. Let love take you places!